About a year and half ago, I took a kimchi making class where I learned to make kinds with Hae Jung Cho, a master preserver and chef. Read about the experience here. I was recently inspired by the Netflix series Cooked, inspired by a book of the same name, written by Michael Pollan. He delves into the health benefits of fermentation and how it’s a technique used to preserve food and also explains all the nutritional value of it. I love that he makes his own kimchi too! It reminded me of this easy recipe. Took me about an hour on a Monday night. Enjoy! day 10 of the kkakdugi – perfectly ripe! 1. Wash the radish. Use a veggie peeler to peel the skin. Chop into 1-inch cubes. 2. In a glass, ceramic, or stainless steel bowl, place the radish cubes and sprinkle with 1 TB of salt and 1 tsp of sugar. Let this sit for about 40 minutes then drain radish in a strainer or colander for 10 minutes. 1. While the radish is sitting in the salt and sugar mixture, wash and trim the green onions and watercress. Chop them into 1-inch pieces and set aside. 2. In a large glass, ceramic, or stainless steel bowl (plastic may stain), mix together the fish sauce, ground red pepper, garlic, and ginger. 3. Add the cubed radish to the bowl and incorporate until all sides of the radish are coated (I suggest using one-time use plastic gloves). 4. Add in the watercress and green onions and gently mix. 5. Taste to determine whether to add more salt into the mixture. 6. Put mixture into a container, like a glass kimchi or mason jar, pressing down to reduce air bubbles. 7. Pour a small amount of water in the mixing bowl to collect all the remaining seasoning and pour into the container. Press down again. 8. Cover container and let it sit in a cool, dark place at room temperature for 2-3 days. Then, refrigerate and enjoy in about 8-10 days as it takes about 10 days to 2 weeks for full fermentation. I substituted fish sauce for salted shrimp due to a shellfish allergy. To use salted shrimp, add 2 1/2 TB instead of 2 TB of fish sauce. I like making my own kkakdugi as it is less sweet and less salty than the store bought kind. Very refreshing. This entry was posted in Asian food, kimchi, Korean food, Recipes on March 31, 2016 by honeyandlimes. I love Korean BBQ places but often the kimchi is disappointing. I dunno why they focus on all the other banchans (side dishes) and meat while neglecting quality kimchi. What ups the flavor quality and experience for me is grilling it to get that nice caramelized taste. I made some kimchi quesadillas this week as my roommate brought her mom’s homemade kimchi to share. Made with organic, locally grown napa cabbage, it’s really good and even better when grilled and combined w/cheese. 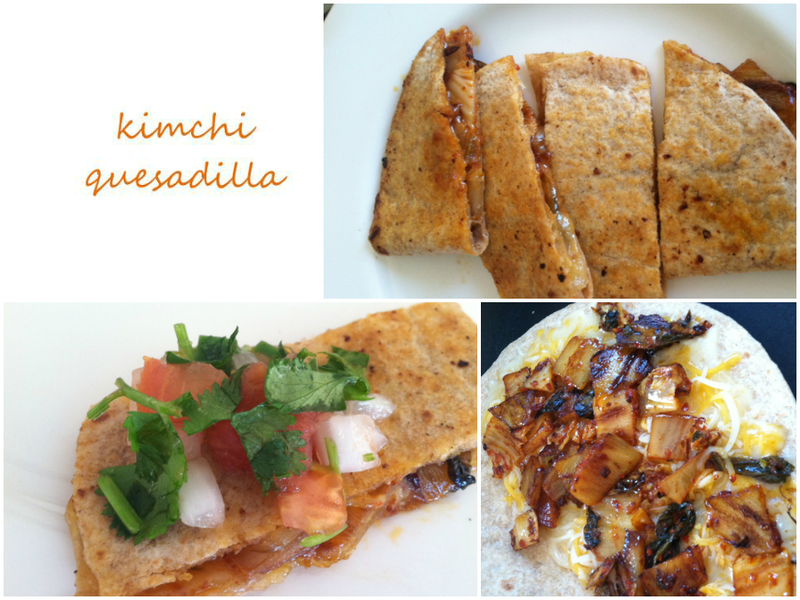 Check out my easy recipe for making kimchi quesadillas below. Love me some kimchi and 3-ingredient dishes! Place a frying pan on medium heat and add 1 tsp of vegetable oil and kimchi. Pan fry until browned (in my picture, it looks burned but it’s not) and set aside. Adjust stove heat to medium low and place a tortilla and sprinkle a handful of cheese evenly on half the tortilla. Scatter half the kimchi on top of the cheese. Place another handful of cheese over the kimchi layer and fold over. Brown both sides of the tortilla or until the cheese is all melted. Place quesadilla on a cutting board; should rest for a few minutes. Slice into 4 pieces and repeat the same process for the 2nd quesadilla. Enjoy w/some pico de gallo. Try this and tell me what you think! Check out my other Asian fusion recipes like the kimchi mac and cheese, korean tacos, or bulgogi pizza. 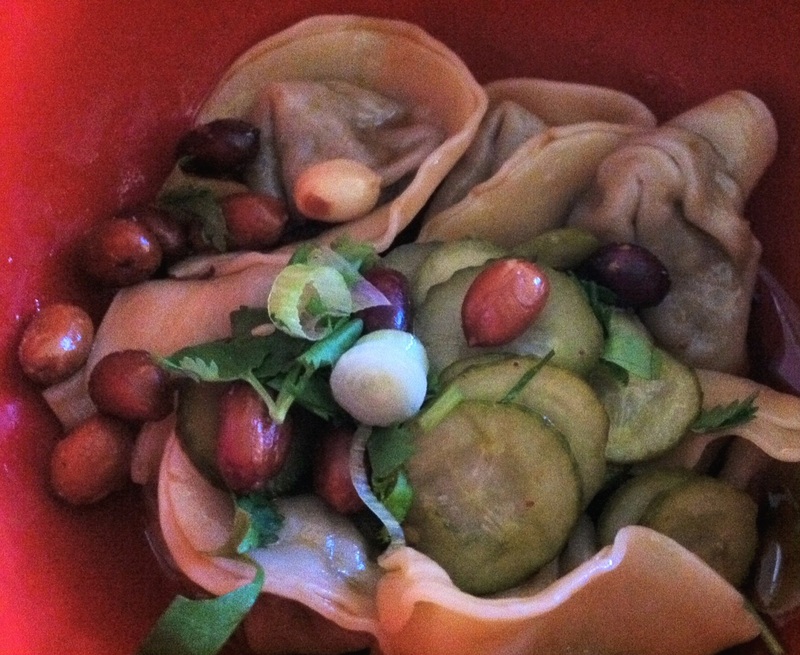 I also love this blog that features more Asian fusion recipes. This entry was posted in Asian food, Asian fusion food, good eats, Korean food, Recipes and tagged Asian fusion, kimchi, quesadilla, recipes on April 11, 2014 by honeyandlimes. c) I’m often cook new and interesting dishes. The reality is often less glamorous as I have my usual rotation of weeknight meals. It changes here and there but my foolproof, go-to meals are fried rice, stir-fry, simple pastas, and vegetable soups. Sounds simple, right? It is, because like most of you, I don’t have the mental energy or want to eat dinner at 9pm on weeknights. Confession: when it’s super busy at work, I rely on the frozen foods section of Trader Joe’s for my dinners (I love their mushroom risotto and margherita pizza). Hope you make it for the loved ones in your life! It’s worth the effort and chopping. Btw, the sauce measurements are estimates. 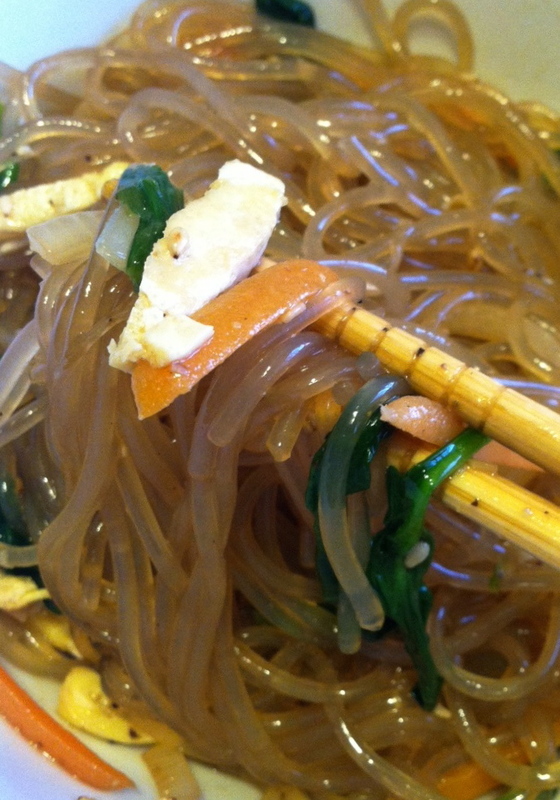 Just like your umma, I eyeball it and season to taste for that balance of soy sauce and sweetness from the sugar. 1. Boil noodles in a large pot for about 6-7 minutes. Drain and rinse in cold water and cut so they’re not too long (and hard to serve). 2. If you’re adding egg, on a lightly oiled frying pan, cook the egg like an omelette on medium low heat. Set aside to cool for about 10 minutes and slice into strips. Saute all the veggies separately. Start w/cooking the onions with 1 tsp of veggie oil and salt + pepper until lightly cooked (like a stir-fry) and still crunchy. Add the green onions toward the end (since they cook quickly). 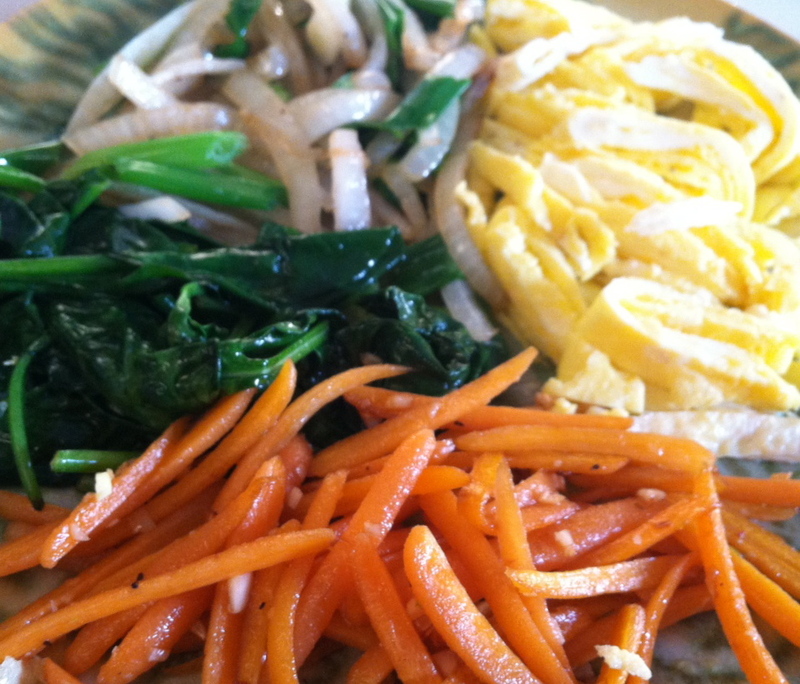 Repeat this process w/carrots, spinach (I used sesame oil), mushrooms, and bulgogi at the end. When the bulgogi is cooled, slice into thin strips. Set aside. Tip: This step can be done the night before. 3. In a small bowl, mix all your ingredients for the sauce until the sugar dissolves. 4. In the large pot, add back the drained noodles and on low heat, mix 3 TB of sauce into the noodles until warmed through. Turn off the heat, add the remaining sauce and beef/veggies. Check for flavor. Does it have the right amount of sweet and saltiness? Add more sugar, soy sauce, or sesame oil depending on the missing flavor(s). When it tastes just right, sprinkle sesame seeds and black pepper. 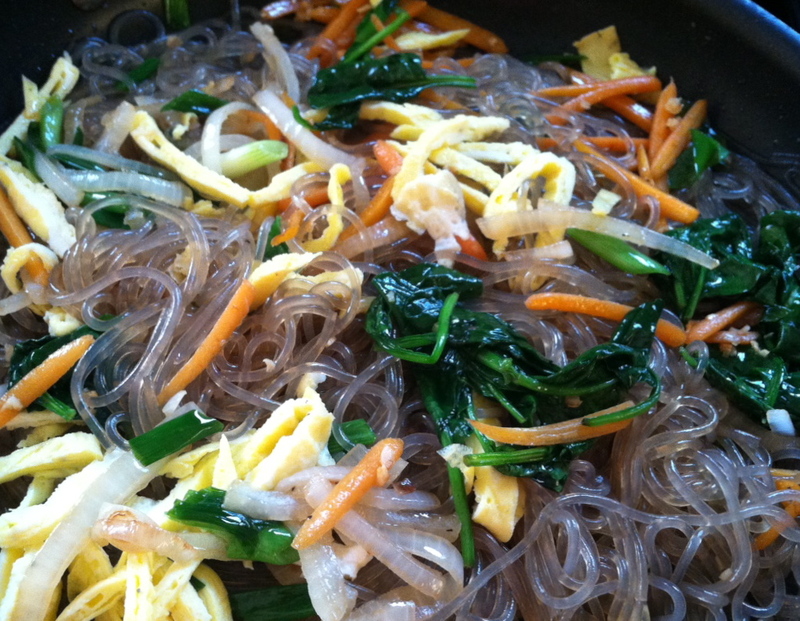 This entry was posted in Asian food, Korean food, Recipes and tagged dinner party, japchae, Korean food, noodles on March 12, 2014 by honeyandlimes. I am my parents’ daughter. The more I interact with them, the more I see their personality traits and quirks reflected in me. 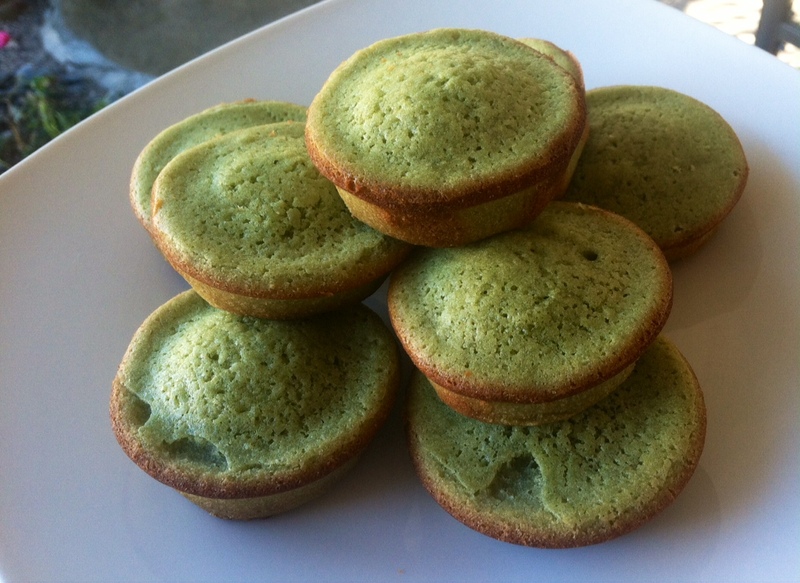 I’ve been obsessed with making this matcha mochi muffin recipe. I’ve made it 4 different times and they have been my go-to taste testers. My mom will take a bite and then analyze the texture, flavor and comment on how this batch is different from the prior one. While this is going on, my dad will gleefully pop 2 or 3 in his mouth. I’m the same way. I can’t wait to get my hands on a warm one right out of the oven but I’m also my harshest critic. They taste good, but look beat up and burnt. They’re not chewy enough, too soft… etc. All this to say, I got it right the fourth time! Try this easy recipe (just follow my recipe and it should turn out just right). This is an aside but I think it’s really sweet that my dad picks lemons for my mom when he’s playing a round of golf. When I asked him if it’s ok (by management), he said, there’s so many they won’t notice :). 1. Preheat oven to 340F. 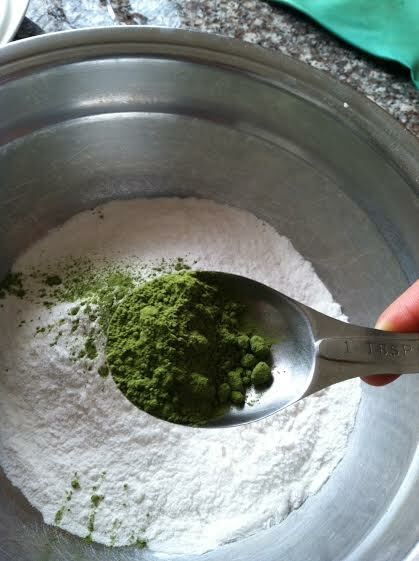 In a large mixing bowl, whisk rice flour and matcha powder together. Add remaining ingredients until incorporated. 2. Generously grease 2 cupcake/muffin pans with more oil than you think you need. Why? Rice flour and sugar get very sticky. The batter should sit in a pool of oil. I know, it sounds gross but it’s ok. Fill each hole half way and bake for 30-35 minutes. Switch your pans about halfway through baking time. 3. About 30 minutes in, check to see if they’re done by sticking a toothpick inside. Should come out clean (or w/a little crumbs, not big ones). It’s ok if it looks a bit under done in the centers. The outer edges should be nicely browned (and crispy). 4. Once they’re done, use a plastic knife or fork to run along the perimeter of each muffin to loosen it (plastic so you don’t scratch your pans). Do it immediately after you’ve pulled it from the oven. Otherwise, it’s very sticky and difficult to fish out. Trust me on this. The first time around, mine had wholes on the bottom. Notes: You can find matcha powder and rice flour at Asian supermarkets. I found mine at HMart. 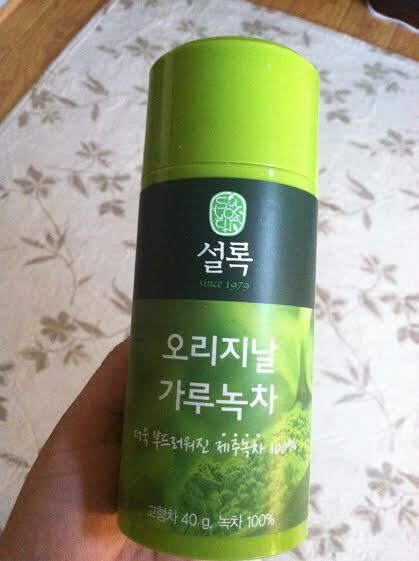 I like this Korean brand of matcha powder (about $7). It’s more affordable than the Japanese brands and has good flavor. I tried baking these in cupcake liners but you won’t get the browned edges that give its crispy bite. Thanks also to all my friends who’ve been my recipe testers. I appreciate that you appreciate good eats. 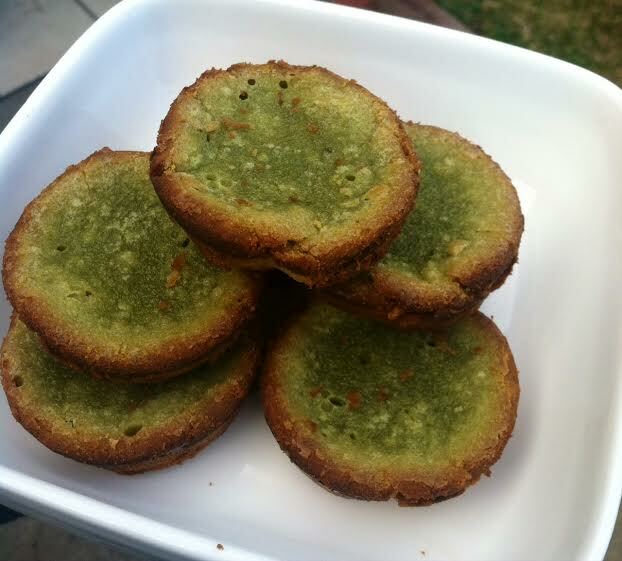 This entry was posted in Asian food, dessert, Recipes and tagged Asian dessert, green tea, Japanese, matcha, mochi, snack on January 21, 2014 by honeyandlimes. 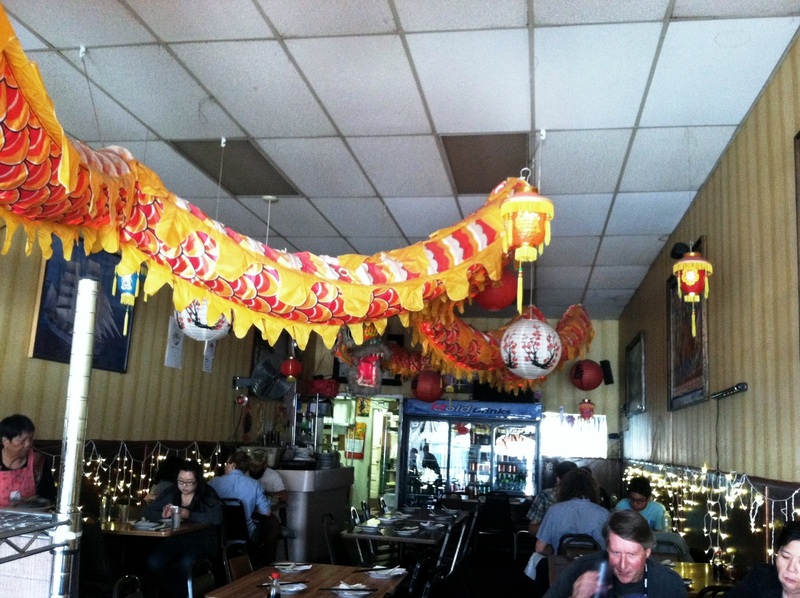 I was in SF for a wedding last fall and tried Mission Chinese Food (MCF) in the Mission District. My friend was kind enough to treat me to a delicious lunch after church on a bright Sunday afternoon. The funny thing about SF is that summers are overcast/chilly and fall may actually have better weather. You can tell who the tourists are because they’re usually wearing shorts and t-shirts (and freezing) and the locals are dressed in layers. Thankfully, it was a beautiful Sunday walk-the-dog kinda afternoon in October. From the outside, MCF looks like a nondescript Chinese restaurant. 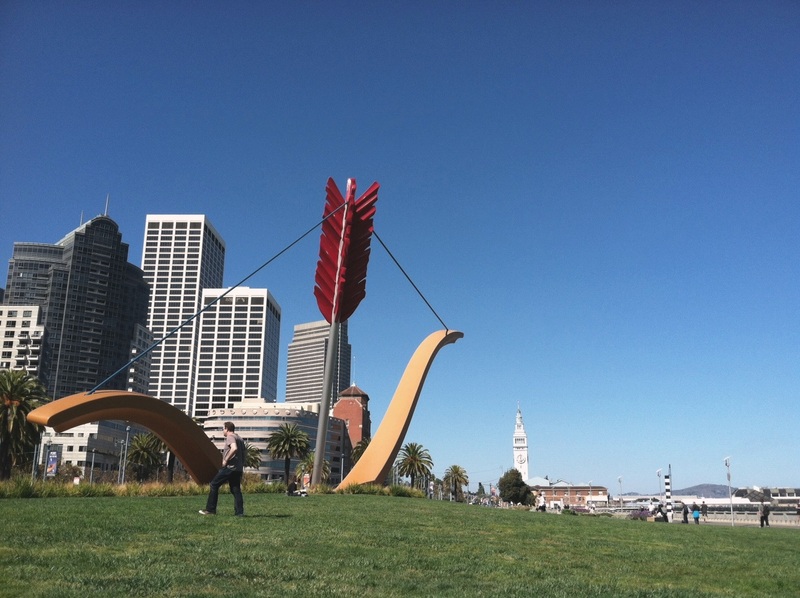 Prior to MCF, it was a food cart called Mission Street Food and became so popular they hosted pop-ups at this location. Check out this article for the full backstory. We came around 1:30pm or 2:00pm for lunch and were seated right away. My friend was telling me that dinner can be a bit of a wait. I recommend that you come during the day and avoid the waiting game. Also, there are so many good eateries in this area including Bi-Rite ice cream, Tartine bakery, and Mission Beach Cafe (great brunch spot). 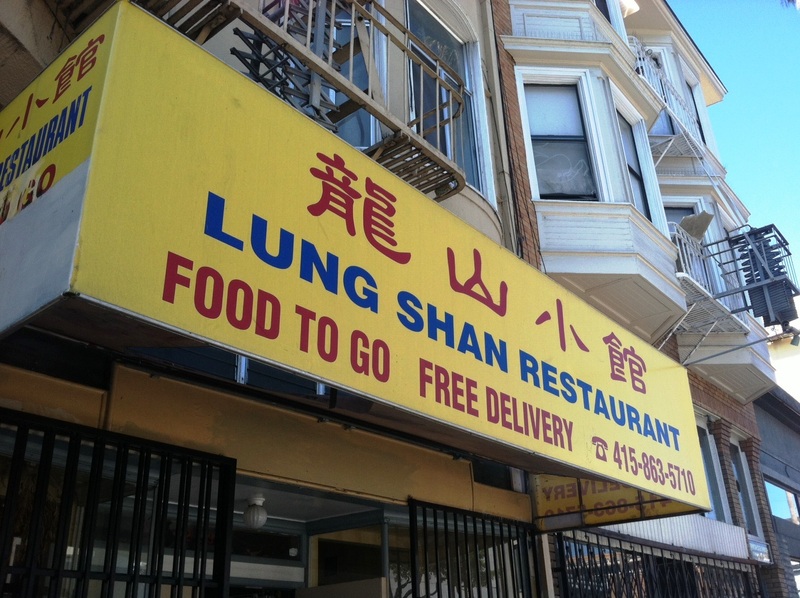 I enjoyed their funky, salty interpretation of Chinese food. Overall, I found the food to be on the salty side but their flavors were very addicting. I particularly enjoyed the chicken wings which were buried under a pile of Sichuan peppers which looked spicy but wasn’t overly spicy (like Southern Thai food). The seasonings were an intriguing blend of salty/sweet hint of brown sugar, spice from the peppers, and vinegar flavors that were dancing in my mouth. The fried tripe was also a nice surprise. 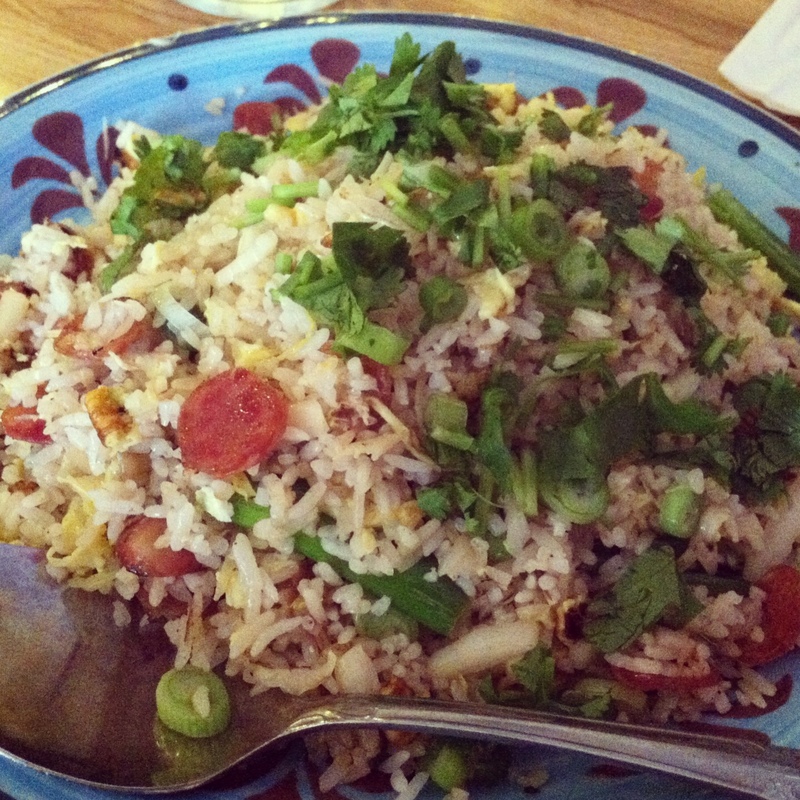 The salt cod fried rice was also delicious and very addicting. The lamb dumplings I wouldn’t order again. They weren’t memorable and left me with an oily aftertaste and not much flavor. In the tradition of Chinese restaurants, I appreciated that they provide you with a pot of tea to help wash down the oily, salty food. Given that I’m not a huge fan of Chinese food, I found this interpretation a good twist (although on the salty side). I would go back to try their pork belly and a few other dishes but it’s a bit on the heavy side. Check out another blog post documenting my Bay Area visit where I talk about the Ferry Building and other good eats. This entry was posted in art, Asian food, cool neighborhoods, foodventures, restaurant reviews, travel and tagged Chinese Food, Mission Street Food, the Mission District on January 12, 2014 by honeyandlimes. Earlier in the month, I was wandering through the farmers market on a rainy Saturday morning and came across stalks of lemongrass. That got me thinking about making green curry which one of the key ingredients is lemongrass. Since I have easy access to Asian supermarkets like Ranch 99, I was able to pick up items like coconut milk and an authentic green curry paste (see note after recipe). This is an easy and economical weeknight dinner that takes about 30 minutes and is great the next day. If you like curry, check out my yellow curry recipe (my first blog post). It’s another easy weeknight dish. 1. In a medium pot or wok on medium-low heat, add 1 tablespoon of oil. To that, add 2 tablespoons of curry paste. Saute until fragrant, which will be about 20-30 seconds. Pour in about half the can of coconut milk and stir. Let the mixture simmer for about 3 minutes. 2. Add fish sauce, brown sugar, chicken broth, and remaining coconut milk and bring to a boil. Add all the veggies and cook for about 4 minutes or until they are softened. Lastly, add the shredded chicken to heat up. 3. Turn off the heat and add fresh basil to serve. Enjoy with rice or rice noodles. 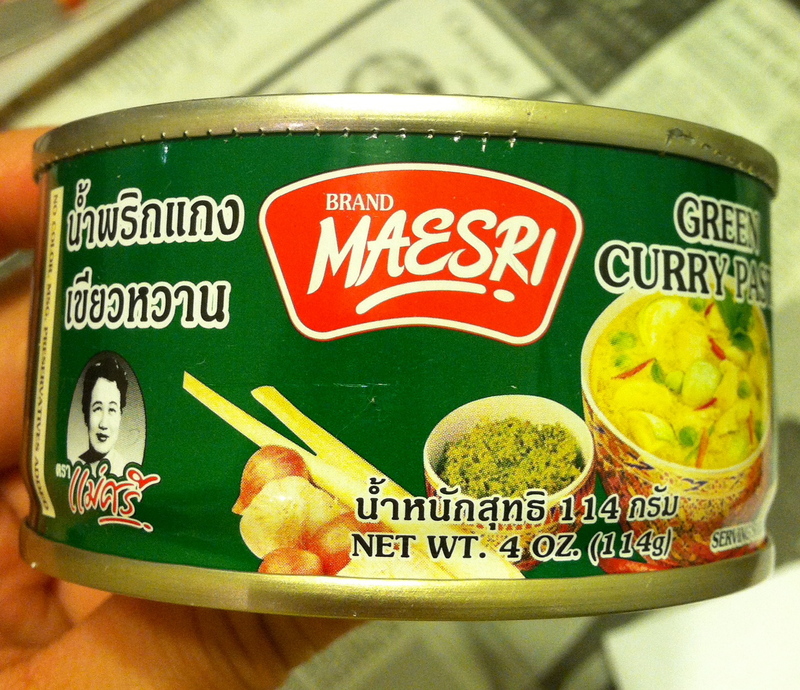 Note on green curry paste: I recommend the Maesri brand of curry paste (amazon sells it) from Ranch 99 for about $1.59 for a 4 oz can. It’s the real deal. The ingredients are legit (like green chiles, kaffir lime, galangal, and a whole bunch of spices) and it saves you the time/hassle of buying at least 8 more ingredients to create the curry paste). Also, it’s free of MSG and other preservatives (and a product of Thailand). Some recipes that I found have you actually make your own curry paste but I don’t think it’s necessary unless you lack access to quality Asian products. Veggies: You can easily swap out the veggies listed above for whatever you have at home. I would recommend keeping the peas, so good! Traditionally, Thai eggplant is the main veggie in this dish but add what you like. Also to note: some recipes call for sliced Thai chili to garnish the soup. Personally, I thought the curry had enough of a peppery kick but if you want to turn the heat up, by all means add some Thai chili but proceed with caution; the smaller the peppers, the spicier they are. 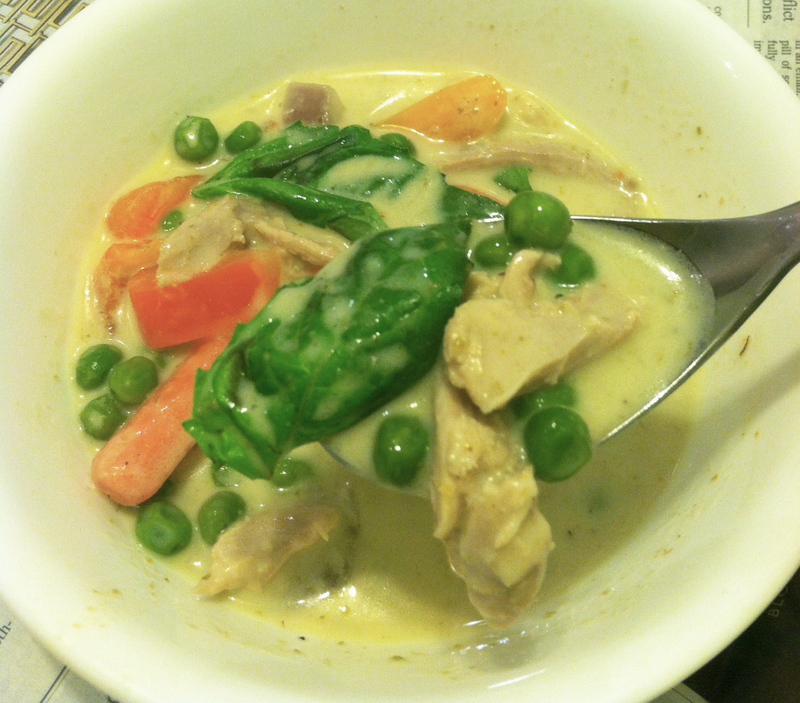 This entry was posted in Asian food, cheap eats, chicken for dinner, good eats, Recipes, Thai food on December 17, 2013 by honeyandlimes. If I were a book publisher, I would give this food blogger a cookbook deal for my selfish pleasure. I love her recipes as they are great for a Korean American palate. Familiar enough flavors, yet blending the Asian and Western traditions with simplicity. Her recipes aren’t fussy and they are also well described and executed. Lots of Korean or Korean inspired dishes and yet a mixture of other ethnic dishes such as Italian American. I ‘cook’ off her blog at LEAST once a week if not more. I tried this one over the weekend. Delicious. Takes some time to make and care but it’s well worth it. Enjoy! In a heavy saucepan, add all ingredients for glaze together and cook until simmering, reduce heat, and maintain low simmer for about 20 minutes, then set aside. 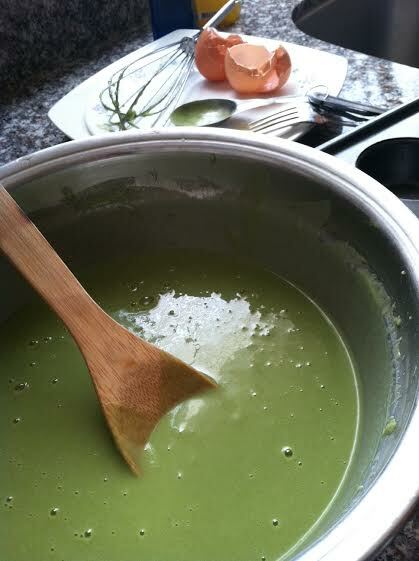 The mixture won’t be thick and syrup-y, but the glaze mixture will reduce and the flavors will be concentrated. This can be done ahead of time (save time) and allow to cool to room temperature. Preheat oven to 400. Heavily line a roasting pan with several layers of tin foil to prevent it from creating a burnt sticky layer that’s hard to clean. Lay the chicken thighs on the pan in a single layer. Place in oven and cook for 20 minutes, until cooked through. Carefully brush glaze over the cooked chicken. Be generous with the glaze allowing it to fully cover the chicken. Return chicken to the oven and cook for another 10 minutes. Take chicken out, flip it over and add more glaze and cook it again for another 10 minutes. Again, take it out, use whatever leftover glaze you have plus pan juices and coat the chicken well and cook for another 10 minutes. The chicken will be well coated and glossy from the glaze. Remove from oven and serve immediately. Tip: the chicken tastes better the day after you make it since it’s been soaking in the glaze overnight. Great with rice and this salad or a side of veggies. 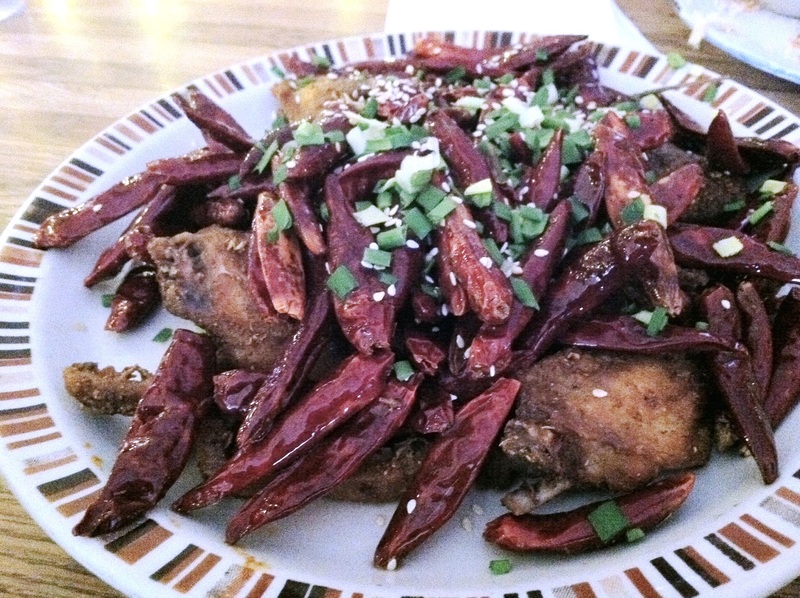 This entry was posted in Asian food, chicken for dinner, Recipes and tagged chicken on September 6, 2010 by honeyandlimes.